What is non-ablative fractional laser? Fractional laser differs from full field resurfacing. Full field resurfacing removes the whole surface area of the treatment site (eg in a Microlaser Peel). Fractional laser heats up thousands of channels into the skin, covering only a fraction of the surface area of the treatment site. This action activates the body’s wound healing mechanisms, but leaves the surrounding skin intact, so that rapid healing is possible. Who should have fractional laser? How does fractional laser work? What are the side effects/risks of Fractional Laser? 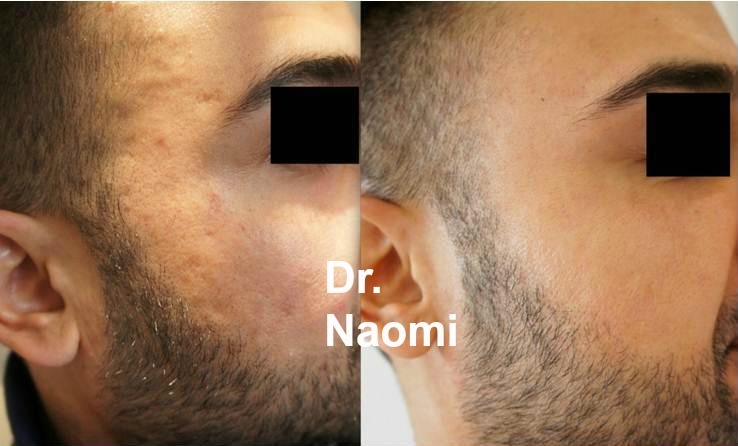 Hypopigmentation (decreased skin pigmentation) This is possible after Erbium laser. The deeper the treatment, the greater the likelihood of this occurring. This is uncommon in full facial resurfacing at mild to moderate depths. Hypopigmentation in a very small area is likely when removing a deep benign mole/naevus. A history will need to be taken, including history of other treatments, complications, skin type and history of cold sores. Examination of your skin and what needs to be required. A topical anaesthetic will be applied for 1 hour prior to the procedure with glad wrap. The patient’s face will be cleaned and the treatment will take place. The treatment will take about half an hour to 45 minutes. It is mildly uncomfortable, and happy gas is available, but most patients do not request it. The skin will be red immediately after the treatment. Most patients choose to go to work the day after non-ablative fractional laser. Very rarely there might be swelling the day after, particularly if multiple passes are used on the under eye area. The skin can be a little rough and dry for a few days after. How many treatments of non ablative fractional laser will I need? For rejuvenation, patients can typically be satisfied after between 1 and 5 treatments. The important thing to consider when having fractional laser, is that fractional laser, by definition, is not covering the full surface area of the skin, so the results are limited by that fact, hence the fact that multiple treatments will be required. My most typical coverage when I’m using my fractional laser on the face is around 10%. Which means that we are only treating about 10% of the patient’s skin, so there is really only potential for around 10% improvement at best.